Indeed. Well done. It's still a 128k. Who knows... you might find the upgrade is a piggyback and easily undoable, should you desire to do so. tezza wrote: Thanks. Yes, I'm glad to have got this. It was the one model my classic collection was really missing. Congratulations! If I hadn't just spent similar money on my Atari 800 I'd have been in the bidding too. SE/30s are amazing... I just fixed the 2 I got from the opshop. Man, wonderful design. Awesome board design - apart from the weak capacitors. Yes a family portrait would be great..lol. I agree re: the SE/30s. I've got one too. It's blazingly fast! Have you recapped your SE/30 motherboard? My sound is very quiet on one of them - classic symptom of a recap needed. In fact, even the classic and classic II motherboards of that era are losing their sound volume over time. mrad01 wrote: Have you recapped your SE/30 motherboard? My sound is very quiet on one of them - classic symptom of a recap needed. In fact, even the classic and classic II motherboards of that era are losing their sound volume over time. At the moment it seems to work ok without the "falling bomb" whistle associated with cap failure. Probably only a matter of time though. Maybe I should store it upside down? When...err I mean if.... it fails, SMD is quite easy with a hot air gun + solder paste + desoldering wick + some sort of clip on magnifier + tweezers. I wouldn't do anything more than a single component with an actual iron (great for reflowing SMD IC's though). I need to do my LC board, but haven't been motivated enough to start ordering replacement caps yet. SpidersWeb wrote: When...err I mean if.... it fails, SMD is quite easy with a hot air gun + solder paste + desoldering wick + some sort of clip on magnifier + tweezers. I wouldn't do anything more than a single component with an actual iron (great for reflowing SMD IC's though). I have a "spare" SE/30 board which I'm going to start - it has no CPU or ROMs in the sockets, so a good test case. I picked the unit up from "creature1". Nice guy. He was pleased the computer was going to a collector. Tonight I cleaned it up, and managed to source a System 2.0 boot disk on the Internet. After writing that to a 400k floppy, I fired up the machine and inserted the disk. The picture below says it all. I couldn't be happier.... I considered posting this under repair and restoration but there is really not much R+R to do! I wasn't so lucky with my VIC20, but think it might be PSU related. As part of new vintage-tsunami there is also Commodore SX64 that has popped up, although very hard to gauge it's condition because there is only one photo. http://www.trademe.co.nz/computers/vint ... 914659.htm pickup only of course. SpidersWeb wrote: As part of new vintage-tsunami there is also Commodore SX64 that has popped up, although very hard to gauge it's condition because there is only one photo. http://www.trademe.co.nz/computers/vint ... 914659.htm pickup only of course. Yes, unless there is more details coming on that one I would certainly consider it a "as is, where is" machine and bid accordingly. So, are you looking at expanding your interests beyond PC-type machine Jono? I know for myself I find the non-PC machines of the late 70's/early 80s a lot more interesting but that could be related to my age and exposure at the time. They are certainly more diverse in style and architecture though. 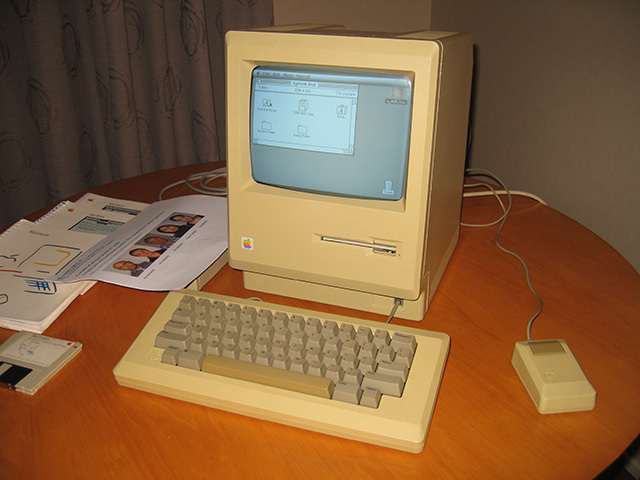 The Mac 128 is not quite as yellow as it appears in the photo. Combination of flash and the natural yellow woodgrain of the table I think. It's more of an acceptable cream colour. That spacebar is greener than it should be though. I won't be retr0Brighting it...at least just yet. I MIGHT consider doing the case if I get motivated enough. I won't do the keys. In my experience coloured keys can easily streak with a retrobright soak and I don't want to take the risk with this one. Wasn't planning to, but despite the normal yellowing it was in pristine condition and only cost a few dollars, so how could I not! The datasette is so shiny it looks new, logos are perfect, no cracks or damaged keys etc. I spotted it through the window and ran in to grab it. SpidersWeb wrote: Wasn't planning to, but despite the normal yellowing it was in pristine condition and only cost a few dollars, so how could I not! Vic 20 cases de-yellow well. I've given the Mac 128 a page of its own on the collection site. I must do the same for the Acorn 4000 at some stage too.